Maggie’s Farm (Tin Machine, live, 1989). The first Tin Machine live gigs in June-July 1989 were more of a preview run than any sort of full-blown tour: only twelve shows, all of which were in modest-sized venues, in the US, UK and Europe. The set design was as severe—stark whites and shadows, calling back to the Isolar tour—as the set list was uncompromising: no past Bowie hits or even obscurities. Instead the band played nearly the entire Tin Machine album, tried out a handful of new songs* and played a couple of Sixties rock standards. The latter seem to have been an afterthought, a mild concession to fans as well as an easy way to extend the set lists, as Tin Machine’s first gigs, in the US, had been nothing but self-penned material (except “Working Class Hero”). The Machine first played their cover of Bob Dylan’s “Maggie’s Farm” at the Docks show in Hamburg, Germany, on 22 June 1989, and it stayed in the set for the rest of the tour. Bowie had covered Dylan sparingly in the past: mainly in his folk gigs in 1969, when he sometimes closed sets with “She Belongs to Me” and “Don’t Think Twice, It’s Alright.” His own “Song For Bob Dylan” was a character piece, intended for another singer (his friend, and Dylan nut, George Underwood), and Bowie’s public thoughts on Dylan were respectful but hardly worshipful—Dylan had been a lesser influence on Bowie’s development, minor when compared to Anthony Newley, Jacques Brel, Scott Walker, Lou Reed or even Biff Rose. “Maggie’s Farm” was an understandable choice as a cover, as it was simple to play (a three-chord song mainly built on an E chord with a vi-V7 turnaround (C#minor and B7 in the original)). Its lyric had some political resonance in the summer of 1989, particularly in Britain, where the impending Community Charge tax would ultimately bring down Thatcher’s ministry in 1990. Bowie sang the five verses as a set of increasing irritations, bellowing the last verse and nearly blowing out his voice. The Machine’s ominous version of “Maggie’s Farm” (in which the band imposed Dylan’s melody upon the chassis of T. Rex’s “Jeepster,” for whatever reason) downplayed how much the Dylan original is comical, an absurdist parody of the standard “Down on Penny’s Farm”—Dylan’s prison labor camp seems run by a gang of ingratiating sadists. Dylan cut the track in one take. The best of his later live interpretations (especially the Hard Rain version with Mick Ronson on a stinging lead) had a swagger and a slide to them (Marc Bolan would’ve done “Farm” much better). Tin Machine stands in the long line of interpreters who have ignored the goofiness and fatalism of “Maggie’s Farm” (the singer shows no signs of actually getting out) in favor of a posturing, macho defiance (Rage Against the Machine comes to mind). A version of “Maggie’s Farm” recorded at La Cigale, Paris, on 25 June 1989, was released as a double-A-sided single with “Tin Machine” in September (EMI USA MT 73, #48 UK). (Bowie utterly bungles the first verse on it.) According to Pegg, a video was shot of the Machine playing “Farm” at the preceding show (the Paradiso, in Amsterdam) but I’ve not seen it. The Machine didn’t bring “Farm” back for their subsequent 1991-1992 tour and apparently made no attempts to cut it in the studio. * Two of these, “You’ve Been Around” and “Now,” will be covered when we reach Black Tie/White Noise and Outside, respectively. 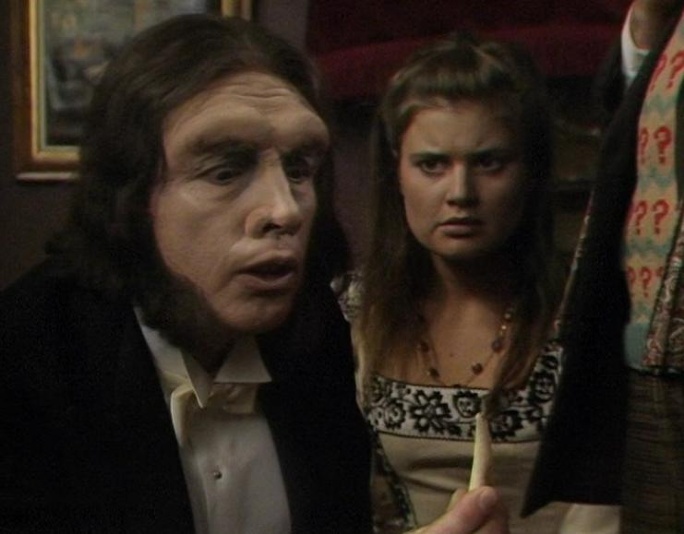 Top: Nimrod, the Neanderthal butler, is awed by the fang of the cave bear (from last Doctor Who serial to be filmed in the 20th Century, Ghost Light, autumn 1989).